I was lucky enough to spend the last five days in New York visiting PINTA, catching up with friends and checking out the vintage stores in Manhattan. All very interesting, but the clothes weren't for sale and I was determined to find some amazing vintage dresses for Juno Says Hello during my short stay. I have tried well-known places like Resurrection before and found the selection very underwhelming - more 80s retro jumpers than 40s or 50s cocktail dresses, but with stellar price tags. The first shop I visited was called Zachary's Smile on Lafayette St, which sells mainly 60s and 70s vintage alongside a selection of clothes by contemporary independent designers. I bought a stunning early 1950s blue and ivory silk frock - perfect for an alternative wedding dress - with a rigid aluminium frame in the corset. Faut souffrir pour être belle! I also picked up a primrose yellow shantung silk cocktail dress with bow details. All my new purchases are being photographed on Thursday and will be uploaded to our online boutique before the end of month! Please sign up to our newsletter on this page for special previews. One of the reasons I buy almost all our stock from the US and Canada is because the quality and condition of the dresses is far superior to most of what is available in Europe. In addition, the sizes are slightly more generous. Many women are put off buying vintage because they believe it will be too small - the waist too tiny, the sleeves too short - but this is simply not the case if you know where to source it. We currently have ten size 16+ dresses in our online boutique and we're about to upload several more - stay tuned. 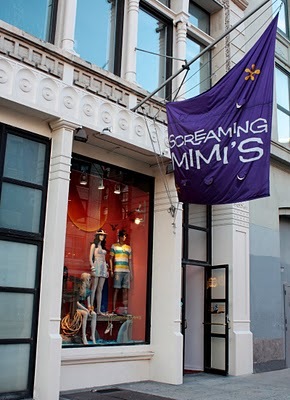 My next stop was Screaming Mimi's, also on Lafayette. This place was fantastic but better for accessories and club-wear rather than cocktail dresses. There was a rail dedicated to 'Bad Christmas Sweaters' which made me laugh. I was wondering whether to buy a 1970s red and yellow skintight satin jumpsuit for my friend Juliette, but just couldn't justify the price tag. Sorry darling! I'll make you one instead. So far, OK, but I didn't strike gold until I found Stella Dallas on Thompson. This amazing shop is named after the 1937 film starring Barbara Stanwyck and had an exquisite selection of vintage dresses, coats and accessories. I found eight or nine incredible frocks that are being loaded on to the aeroplane back to London as I type... then uploaded to our online boutique ASAP. The quality of the fabrics was unlike anything I had seen before - couture gowns and flirty 60s shifts - and I couldn't help but pick up a mink-trimmed winter coat for myself! At this point smoke started coming out of the credit card machine so I held back from visiting anywhere else. Next time I'm in NYC I'm going to try out Rare Vintage - supposedly where Anna dello Russo (pictured right) gets some of her vintage gowns - and the many boutiques in Williamsburg. 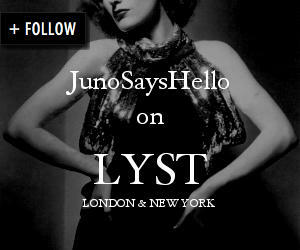 In the meantime, follow us on Twitter or Facebook for previews of all the dresses I sourced in New York. We had a bumper consignment from a lovely lady in Dorset earlier in the month so those dresses will also be featured in our new collection.